Sometimes, what you find tucked away inside an old book is not valuable or fascinating or exotic.1 Sometimes it's just ... an old bookmark. Bookmarks inside books. Imagine that! So, here are a couple of ratty bookmarks I have come across while sorting through books. The film features Katherine Ross, Sam Elliott, Roger Daltrey of The Who and, of course, a cat. Anyone ever read anything by Mr. Deeping? 1. Speaking of cool things tucked away inside books, here's this season's official Papergreat Christmas Gift Recommendation: Michael Popek of the fabulous Forgotten Bookmarks blog has written a book featuring a collection of his best finds: "Forgotten Bookmarks: A Bookseller's Collection of Odd Things Lost Between the Pages." Clearly, we all need to buy a copy of this book and start tucking things between the pages. 2. Jimmy Sangster, who died this past summer (here's his obituary from The Guardian), wrote the screenplays for "The Curse of Frankenstein" and "Horror of Dracula" -- both of which featured Christopher Lee and Peter Cushing. 3. 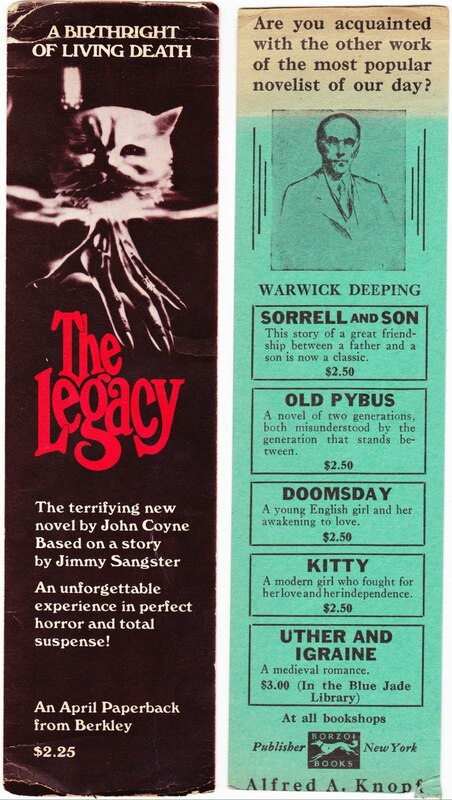 To be fair, Coyne's "The Legacy" does has a four-star (out of five) review on Amazon. 4. There was a Royal Navy vessel named the HMT Warwick Deeping, but I'm not sure if it's named after the writer. 5. The 1929 film version of "Kitty" is notable because it was one of the first British films with synchronized sound. Also, if you are a True Friend of Papergreat, there might be a bookmark with your name on it. Just saying.